Today was a Saturday. Which meant no home school for Nola or the burden of trying to work from home for me. Not having to worry about those items helped out a ton. Roman finally wakes up. Or maybe more accurate, he finally woke me up. I’m not used to having him as an alarm clock. Chances are good that he was awake and chatting with the walls for hours. Guess we’ll never know. The girls are already watching TV. It’s going to be like heaven when all of our kids can just wake up and go watch TV by themselves. So glad we just reset the clock on that little dream—we are pregnant. Made everyone cereal and instant oatmeal because that’s how long it takes to plummet from the highest of heights—see day one. We all eat while watching TV on the computer. Everyone is still watching TV. After counsel from the all-wise Charity Long I decided not to lay Roman down for a morning nap because he woke up so late…um…I think. So with the girls engrossed in some kids show with terrible jokes, and Roman motoring around like an explorer in the world’s most predictable house, I decided to take a shower. It had been a couple of days and it just needed to happen. I’m glad I did. Afterwards I felt so energized and refreshed, and ready to tackle the day with vigor and ferocity. Then I remembered that I’m the sole caregiver for my three children this week. Well, at least I smell clean now. Also decided to shave, while Little Mr. ExplorerPants decides to unearth the contents of our bathroom drawers and cabinets. I had a blast stopping every three seconds to chase him through our room while he’s waving a lidless tube of something in the air, threatening to detonate it like a bomb. The girls are still watching TV. Not gonna lie, this will probably be our anthem today. The floor under Roman’s chair looked like the aftermath of a natural disaster. I’m looking into FEMA for assistance. While that’s pending I pulled out the vacuum cleaner, and it gave me a look like, “You’re joking right?” I apologized and we got through it. Got the girls cleaning the TV room. Well, I got them in the room. Getting them to focus on cleaning is something else entirely. Started making lunch, which is something that I’m learning happens everyday. Didn’t get it happening soon enough. Roman is following me around scream-crying at me because he is so hungry. Doesn’t he know that I gave him life? Just appreciate that you are breathing man. Everyone is now eating and continuing to watch TV. Decided to take down the exterior Christmas lights we put up and plugged in maybe twice during the holidays. Took all of 2 minutes. Whew! Feels good to no longer be that guy. Tried to show Violet how to wrap an extension cable. Not the recommended “production” way, but the down-and-dirty wrap around your elbow and thumb way. She choose to inadvertently invent the, completely-wrap-your-entire-arm-like-a-mummy way. Violet peeks around the corner and asks if she can cut the feet off of her stockings because, “…they’re mine.” I said we should wait until mom gets back because I’m not cutting anything in this house unless I see a signed affidavit instructing me to do so by Charity, along with an accompanying video of her reading it while holding today’s newspaper. I reason that I’m not sure if they are her good pair or not, and would hate to ruin them. We need to go to the store. I tell the girls to get dressed. Violet wants to wear her jammies under her clothes. Always be prepared, you never know when you will have a nap emergency. Violet decides against the jammies and removes them. If we come across a scenario where Violet, by taking a nap, will save our lives I guess we are out of luck. We go to the store for diapers, wipes, and an excuse to get out of the house. Pulled into the parking lot. My mom calls, she’s at my house with homemade beans and tortillas. I give her the garage code and pump my fists in the air, then look back at my kids and tell them everything is going to be alright. Violet opts to traverse the store with the least amount of effort possible. 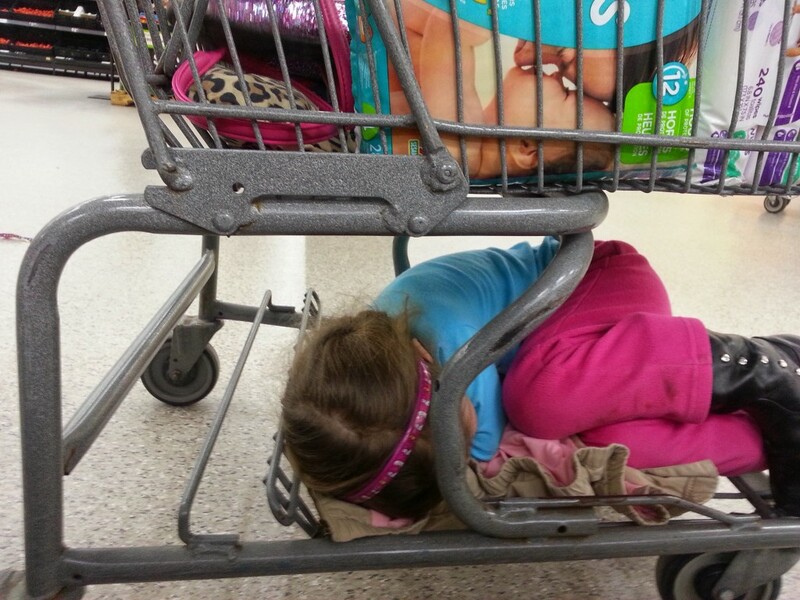 I remember being able to fit under a cart. Those were the glory days. 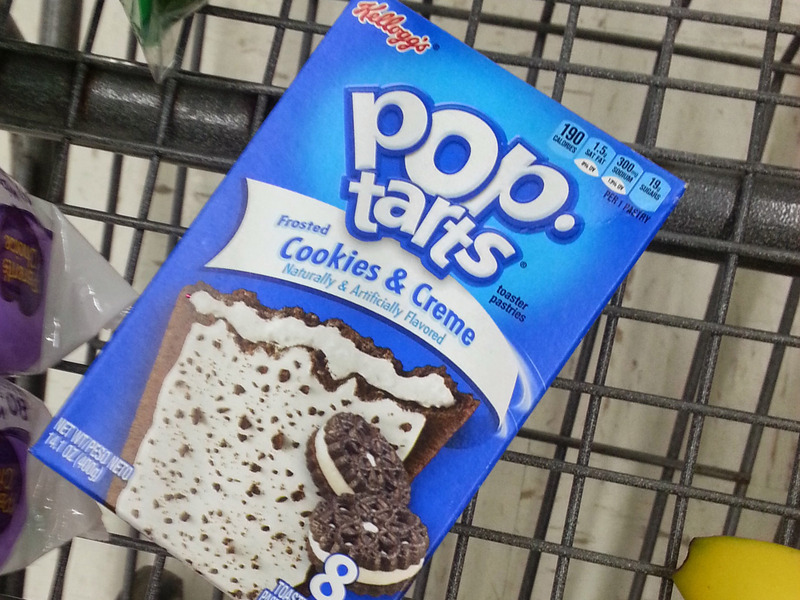 Found this in our cart as I unloaded at the check out. Asked the girls about it. Nola said she had asked me if we could get them, but I didn’t hear her…so I guess that’s a resounding “yes” in her book. My fantastic friend Andrew comes over bringing pizza. Our plan is to wait until the kids go to bed and then eat pizza and junk food while playing video games, like we are 14 years old. Andrew leaves so we both can go to bed…because we are not 14 years old. He says to keep the leftover pizza. This guy has a keen eye for people in need. Most epic write up. The best part of this is sharing the pain…. parenthood 🙂 It’s a good thing we love our kids and wouldn’t trade them (when sane) for anything! Haha! “When sane.” That’s absolutely true.